The small community of Bella Bella, located on the east coast of British Columbia’s Campbell Island, is the home of the Heiltsuk people. This Indian reservation area has been sheltering the Heiltsuk for hundreds of years, and the community is known for traditional values and a tight-knit, familial atmosphere and self-sufficient citizens. However, a modern problem has been plaguing these proud people for several decades now, increasing in severity as the years press on. This problem is rising heating and energy costs, by way of the scarcity of fuel on this remote island. Recently, the Tribal Council of the Heiltsuk decided to partner with several Canadian organizations to make meaningful changes to the way local residents used energy in their homes – and therefore positively impact their lives. The biggest reason for the tremendous heating costs that the Heiltsuk face is the fact that fuel – such as the oil many homes have long been heated with – is difficult to acquire on the island. This means residents pay a premium for every gallon of fuel they use, whether for vehicular travel or to heat their homes. Monthly heat bills have been noted to be in excess of $500 for many families. Tribal Councilor Marilyn Slett has been quoted as saying that the council and their partner organizations decided that electric heat pumps supplied by Coastal Heat Pumps were the best way to address this issue. Replacing the old, inefficient heating systems of many of these homes with electric heat pumps was part of the initial program involving around 20 homes and families. Astronomical heating bills often caused Bella Bella residents to have to choose between fuel costs and other basic necessities such as food for their families. With heat pumps in place, they no longer feel this financial strain. Heating bills have been reduced across the board, being cut in half in many cases. The efficiency of these systems is also far superior to the oil-driven heaters of yesteryear, delivering warmer, comfortable air during the chillier months and cleaner, healthier air throughout the year. Children who previously experienced chronic respiratory and other health problems are now living healthier, happier lives – all because of their new heat pumps. The program has since been expanded to include over 300 more homes in the island community. 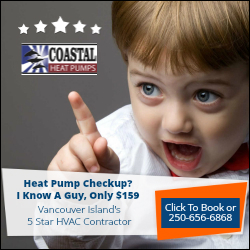 It’s all just one way that Coastal Heat Pumps are helping to make life healthier, easier, and more comfortable for Canadians everywhere. Text narration: Bella Bella is beautiful but remote, which means fuel costs are off the charts. Not only for vehicles, but homes heated on oil. Some families add space heaters but those can cost even more. Text narration: With bills up to $550 per month, the community needed a better solution. So Heiltsuk Tribal Council partnered with Ecotrust Canada. Text narration: So far 20 households have said goodbye to their old heaters and installed electric heat pumps instead. Text narration: Families are noticing big savings – close to $250 per month – and better overall health. Text narration: Heiltsuk Tribal Council is scaling up the program with plans to convert 330 more houses, creating local work. With ample clean electricity from nearby Ocean Falls, community leaders say it just makes sense. Text narration: It’s one more thing making the Heiltsuk Nation strong, self-sufficient, and a great place to call home.